Download Apple QuickTime to view this video. PortalsXpress can help you manage your Board Packet publishing process, removing the need to use costly couriers or mail to distribute materials to your board of directors. We have streamlined the process of generating and distributing Board Packets with our PDF printer driver. We support distribution using our shared folders feature. Just use your favorite editing tools and print directly to your portal. Or if you're already generating PDF board packets, you can continue to use those tools; we're flexible. Add any supporting documents with our upload feature to finalize your Board Packet. Our Board Packets dashboard makes it easy to publish board packets, bylaws, articles, supporting documents, spreadsheets, graphs, etc. Once your Board Packet is ready, drag and drop the new files into your board's shared folder, and the Board Packet is immediately available to your board of directors. If you need to make changes, just update the documents in the portal. Inform your board members of content available on their portal using our Email Blaster feature, which you can use to invite each board member to see their individual portal. This powerful feature has the ability to mail-merge, allowing you to tailor your message. Use our built-in email templates, customize them to suit your own taste, or create your own. 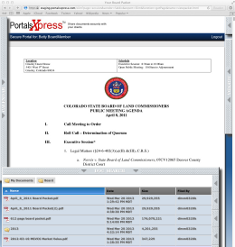 Board members can view their portal using the iPad, iPhone, tablet, smartphone, laptop computer or just about anything with a web browser. No special software to install or maintain. To help your board, you can tell whether someone has been able to access their Board Packet, or whether they have changed or uploaded new files. These optional features help you to make sure your board can access their Board Packet ahead of the meeting. Using their portal, you can supply your Board Members with an arsenal of supporting documents. Our "Doc Search" feature lets your board members find documents as easily as searching the web. PDF, MS-Word, spreadsheets, are indexed for contextual searching - and that makes it easy to find just what you need right when you need it! Our Board Packet viewer includes our innovative "push tech", which lets board members share annotations instantly, update their position in the agenda, add calendar events, and more. Once Board Members get used to having such tools at their disposal, they wonder how they ever conducted meetings without them! We do our best to make your portal match your website's look and feel, retaining your image. This helps your board members feel comfortable using their new portal, and keeps your company's brand (and not ours) right where it belongs. We know that your security is very important, and we protect your portal with 256-bit SSL encryption, the same encryption protection used by banking sites. Your data is stored at our security audited data center in Denver, Colorado. In addition, we've taken great pains and paid attention to the finest detail to make sure that the Board Packets for iPad portal helps keep your most sensitive materials and documents secure. Portal Branding: We'll brand your portal to include your company banner, colors from your website, and your company's domain (your choice). So your Board Members always know that they're logging into their portal. Dashboard: Our Board Packets for iPad Dashboard makes it easy to setup Board Members, publish documents to the Board's portal, preview the Board's experience, and more. Doc Search: Publish an almost unlimited number of documents for your Board. The Board Packet Viewer's "Doc Search" feature lets your Board browse their document archive quickly and easily, and search documents by entering a keyword or two. This is one feature you really have to try to believe; you'll wonder how you ever managed without it! Annotations: The Board Packet portal lets your Board Members annotate their Board Packets (or any PDF document in their archive), using either private annotations that only they can see or public annotations for the whole board. The annotation toolbar lists each public & private annotation and which page it's on; tapping it scrolls to the annotation. And using our "push tech", public annotations are instantly shown to every Board Member the millisecond that they're added. Calendar: The Board Packet portal includes access to a shared calendar. And by leveraging our "push tech", when events are added your Board Members will see those changes instantly. Print to PDF: Generate PDF versions of any document using any Windows application directly to the board member's portal. Administrator Desktop Software: Our Board Administrator desktop software provides you with powerful back-office access to the document archive, email message transcript history, access logs, additional security tools, and much more. 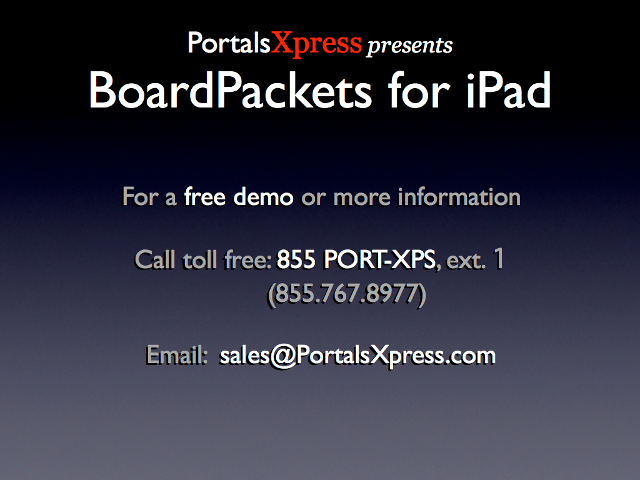 Customization: If our built-in Board Packets for iPad portal doesn't quite fit your needs, we can build a custom portal solution to meet your requirements. no software installation required, all you need is a web browser. iPad is a registered trademark of Apple Inc. QuickTime and the QuickTime Logo are trademarks of Apple Inc., registered in the U.S. and other countries. The Get QuickTime Badge is a trademark of Apple Inc., used with permission. All copyrights and trademarks are the property of their respective owners.